I’m sure many people have heard the nursery rhyme, “Mary, Mary quite contrary, how does your garden grow?” If you want to grow the best garden you can, one of the best ways is to actually use your garbage. In this book the family has a nice garden and grows many different kinds of plants, but in order to make them grow as best they can, they use compost. A compost bin is a good place to put garbage. Naturally we are not talking about plastic bottles or things like “meat scraps or dairy products” because they will attract unwanted animals to your bin. This family’s compost bin is a “big box” made of wood. This is a perfect book to introduce children to composting and its benefits to our gardens and environment. 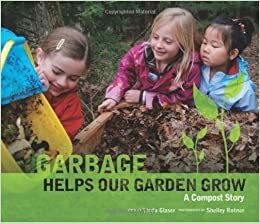 The book has a nice layout and is quite homey in that we see a family and some of their friends actually working on their own compost pile. This personal approach, in addition to the back material, is an easy and fun way for children to learn. Although not stated, you can see how well their garden grows during the growing season. For example, a pumpkin seedling is taken from the compost bin and planted. Later the sisters proudly display their harvested pumpkin. In the back of the book is a two-page tutorial on composting in the form of questions and answers. Quill says: If you are looking for a casual instructional approach to composting, this is one book you may wish to consider!